American physiologist payload specialist astronaut 1990-1992. Status: Inactive; Active 1990-1992. Born: 1950-07-11. Spaceflights: 1 . Total time in space: 13.81 days. Birth Place: Syracuse, New York. Born July 11, 1950, Syracuse, New York. Married to the former Katherine Elizabeth Gester. They have three children. Recreational interests include basketball, scuba diving, model airplanes, astronomy and reading. Received a bachelor of science degree and a master of science degree in chemistry, University of Alabama at Birmingham, Birmingham, Alabama, 1972 and 1974, respectively; a bachelor of science degree in physiological optics, University of Alabama at Birmingham, Birmingham, Alabama, 1979; a doctorate in optometry in 1981; and a doctorate in biochemistry, University of Alabama at Birmingham, Birmingham, Alabama, 1982. Dr. DeLucas is a member of the American Crystallographic Association, American Diabetes Association, Juvenile Diabetes Association, American Academy of Optometry, American Institute of Aeronautics and Astronautics, Alabama Optometric Association, American Association of Pharmaceutical Scientists, National Aeronautic Association, and Executive Committee and Board of the Helen Keller Eye Research Foundation. He has published over 60 research articles in refereed scientific journals, is co-author of 2 books, and co-inventor of 3 patents. Co-Chair, Spacehab Science Advisory Board; Secretary of the Board, Council of Biotechnology Centers, Biotechnology Industry Council; 1st Place in Graduate Student Research Competition sponsored by Sigma Xi. Research Associate in the Institute of Dental Research, University of Alabama at Birmingham, 1975-1976; Graduate Student, 1977-1982 working on combined doctoral degrees in Optometry and Biochemistry; Member of Vision Science Research Center, 1982-present; Scientist, Research Center in Oral Biology, 1982-present; Member, Graduate Faculty, University of Alabama at Birmingham, 1983-present; Scientist, Comprehensive Cancer Center, University of Alabama at Birmingham, 1984-present; Adjunct Professor, Materials Science, University of Alabama at Huntsville, University of Alabama at Birmingham, University of Alabama, 1989-present; Member, Comprehensive Cancer Center Internal Review Committee, University of Alabama at Birmingham, 1990-present; served on External Review Committee, NASA, 1988; Member of NASA Science Advisory Committee for Advanced Protein Crystal Growth, 1987-present; Adjunct Professor, Laboratory of Medical Genetics, University of Alabama at Birmingham, 1990-present; Adjunct Professor, Department of Biochemistry, University of Alabama at Birmingham, 1990-present; Member, Executive Committee, Helen Keller Eye Research Foundation, 1990-present; Professor, Department of Optometry, University of Alabama at Birmingham, 1989-present; Associate Director, Center for Macromolecular Crystallography, University of Alabama at Birmingham,. 1986-present; Director, Center for Macromolecular Crystallography, University of Alabama at Birmingham, 1994-present. 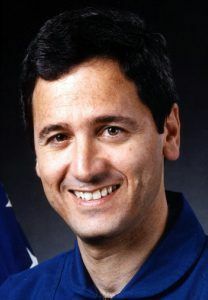 Dr. DeLucas was a member of the crew of Space Shuttle Columbia for STS-50/United States Microgravity Laboratory-1 (USML-1) Spacelab mission. Family: Astronaut. Country: USA. Flights: STS-50. Projects: STS. Agency: Alabama-Birmingham. Bibliography: 12, 5314. 1950 July 11 - . Birth of Dr Lawrence James 'Larry' DeLucas - . Nation: USA. Related Persons: DeLucas. American physiologist payload specialist astronaut 1990-1992. 1 spaceflight, 13.8 days in space. Flew to orbit on STS-50 (1992)..
STS-50 - . Call Sign: Columbia. Crew: Baker, Bowersox, DeLucas, Dunbar, Meade, Richards, Trinh. Payload: Columbia F12 / USML-1 / OAST. Mass: 11,153 kg (24,588 lb). Nation: USA. Related Persons: Baker, Bowersox, DeLucas, Dunbar, Meade, Richards, Trinh. Agency: NASA Houston. Program: STS. Class: Manned. Type: Manned spaceplane. Flight: STS-50. Spacecraft Bus: Shuttle. Spacecraft: Columbia. Duration: 13.81 days. Decay Date: 1992-07-09 . USAF Sat Cat: 22000 . COSPAR: 1992-034A. Apogee: 309 km (192 mi). Perigee: 302 km (187 mi). Inclination: 28.50 deg. Period: 90.60 min. Carried United States Microgravity Laboratory. First extended-duration mission. Payloads: United States Microgravity Laboratory (USML)-1; Orbital Acceleration Research Experiment (OARE); Investigations Into Polymer Membrane Processing (IPMP), Shuttle Amateur Radio Experiment (SAREX)-ll; Ultraviolet Plume Instrument (UVPl) . 1992 July 9 - . Landing of STS-50 - . Return Crew: Baker, Bowersox, DeLucas, Dunbar, Meade, Richards, Trinh. Nation: USA. Related Persons: Baker, Bowersox, DeLucas, Dunbar, Meade, Richards, Trinh. Program: Spacelab. Flight: STS-50. STS-50 landed at 11:51 GMT. .